After school programming should offer fun and educational experiences to children of all ages. Providing a wide variety of activities can make the experience more enjoyable for kids and staff. During the school day, children are often expected to sit still, keep their voices down, and focus on learning. Consequently, when it comes to after school hours, kids are full of energy. Exercise during the after school program is not only good for students' physical health but also for their emotional well-being. Celebrate the peculiar abilities children discover by hosting an Obscure Olympics. Children of all ages can take part in events separated into heats by grade level. Depending on how much time you have, the games can be held in one afternoon or take place over the course of a week. Obscure Olympics is a great activity for involving an entire after school program. Brainstorm events that showcase unusual talents and abilities. Some examples might be how long a child can hop on one foot in a circle, who can hold a backbend the longest, staring contests, thumb wrestling, left-handed basketball shots or crab-walking races. Any event that seems out of the ordinary is acceptable. Prepare a list of events with rules for each one. Allow students to sign up for different events. Once students have signed up, you'll need a master list of events and students participating in each. Allow time for each student to create a flag that represents himself. Separate students into groups based on age or grade level. Start with one event and explain the rules to the group. Students who signed up for the event can take turns competing while other students cheer. Track all scores on the master list. After all events have been completed, tally the scores to find the top three finishers in each event. Announce winners in a closing ceremony and award medals. Outdoor water activities are ideal for summer fun in the backyard but can be difficult to manage in a large program. Spray Tag is an easy and affordable way to incorporate water games into an after school program. 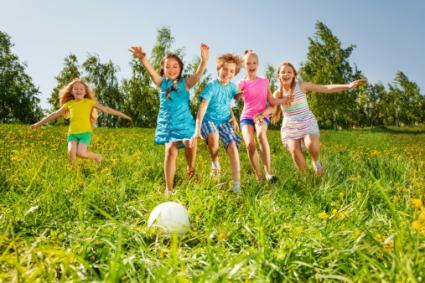 Children of any age can play Spray Tag, however, for safety reasons, it is best to play this game with around 15 children in a small, grassy outdoor space. One person is designated as 'It' and holds a spray bottle filled with water. All other players try to avoid getting wet by running around within the defined boundaries. If a child gets sprayed, he then becomes 'It' and grabs a full spray bottle. The game continues until all spray bottles are in use. The players who do not have a spray bottle in the end are the winners. At the end of the game, each winner gets a spray bottle. All kids designated as 'It' during the game should line up to get sprayed once by each winner. The use of spray bottles should prevent any child from being soaked. Depending on the area available for the game, it is possible for the ground to become slippery, so caution children about this. An expansion of Capture the Flag, this statically charged competition requires little planning. Children in second grade and up can easily participate in this strategic team game. One round can include an entire class and should take around 10-15 minutes. Place one bin at each end of a large open area such as a gymnasium. Divide the group into two equal teams and designate one color balloon for each team. Blow up the balloons and give one to each player in the color that corresponds to his team. Students must charge up balloons with enough static to make the balloon adhere to their bodies. All students on one color team will stand in line with their bucket. The other team will do the same on the opposite side of the room. On 'Go' students must try to grab balloons from the other team and place them back in their team's bucket. Players may only carry one balloon of the opposite color at a time. If a student's balloon is stolen, he must sit on the sidelines and watch for the rest of the game. If he is holding a balloon at the time his is stolen, he must give it back to the person he stole it from. If a balloon is floating freely on the floor or in the air, any sidelined player from the team of the same color as the balloon can grab it and re-enter the game. When all players from one team are out, the balloons in the buckets are tallied. The team with the most balloons in their bucket wins. While after school activities should focus more on fun than anything else, they should also supplement educational goals when possible. After school programs often have more freedom and creativity in lesson planning. Make learning fun and kids will look forward to attending. Incorporating activities from different fields can help keep an after school program exciting. This simple music activity will help students learn basic musical concepts while having fun. Children ages 7-10 are most likely to grasp this concept and find it challenging. The individual portion of the activity will take around 15-20 minutes. If you include a group performance, the activity may last up to an hour depending on how many kids participate. Give each student an instrument, piece of paper and two different colored crayons. Instruct students to find two sounds they can make using their instruments. Next, students should assign a color and a shape to each sound. For example, hitting the top of a drum might be represented by a blue square while hitting the side of the drum is symbolized by a red circle. Students should write this at the top of the blank paper. Using the two symbols, students will then need to write out a rhythm or pattern. When each student is finished writing a rhythm, she should practice playing the song. At the end of the activity, students can perform their song for the entire group. 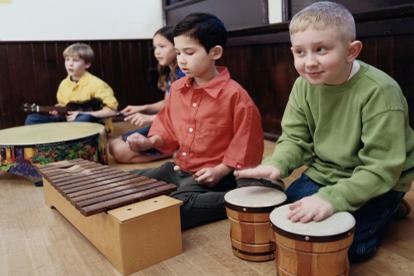 For added difficulty, give each student two instruments and ask them to create a song using both instruments. Colorful plastic eggs have many uses outside of traditional Easter egg hunts. Children of any elementary grade can participate in this treasure hunt. Choose a one-sentence message to use for this activity. Something like, "Today we have an ice cream party!" Using a large font, print the sentence. Then, cut the sentence so each word is on a separate piece of paper. With eggs of the same color place each piece of paper into a plastic egg. If you are planning this activity for multiple groups, you will need eggs of a different color for each team. Hide all the eggs within a designated area such as a classroom or section of the library. If this activity is used for children who are unable to read, substitute the words in the message with pictures. Each team must stay together for the duration of the activity. As a team, players need to find all the eggs in their designated team color. Once all the eggs have been found, students can open them and retrieve the message pieces. Teams must place the message parts in the right order to find the answer. When a group believes they have the correct answer, they can raise their hands and wait to have it checked. The activity continues until all groups have figured out the message. Learning new words and how to use them can be difficult. This fun game pits student against student in a battle of wits. Students in second grade and up are best suited for this activity. Preparation: Create vocabulary cards by writing a new word on one side and the definition on the back. Make enough for each student in the group to get one or two. Select two students to begin and have them stand in front of the group. Give each student a vocab card and instruct them to read through the definition for a minute or so. When time starts the students must make up a conversation together where each uses his vocab word at least once. This works well as a timed event with a short timeframe like two minutes. Choose two new students and begin again. Continue game play until all students have had a turn. Any student who completes the challenge is a winner. A competitive variation of this game would be to have the winner of each round stay in front of the room and compete in the next round by only selecting one new player each time. This activity can be completed with any group of two or more people who are able to read and write. The outcome will be different every time and there is no planning involved. It is a great spur-of-the-moment activity that requires students to search for context clues. Select one person to begin the story. On the first line of the paper this person should write an opening for a story using two sentences. The writer should then fold the first sentence over backwards so the next writer can only see the second sentence. The next person in line will read the visible sentence and try to continue the story by writing two more lines. This writer should fold over the paper so only the last line written is visible. Continue in this fashion until all participants have had a chance to write part of the story. If you only have a few players, each player should write more than once. If you have a lot of players, you can split into groups to create multiple stories or simply add a new piece of paper when needed. Once the story is complete, read it out loud. Arts and crafts activities can be great for rainy days, times when kids are low on energy, or when you need to help them calm down. Most crafts can be adapted to any age group with a few simple supply substitutions. Younger students might need safety scissors, crayons and glue dots while older students can use markers or tape. Using recycled materials to create useful activities is a great way to make affordable crafts that can entertain kids long after your after school program is over. Third to sixth graders are the best candidates for this craft because it requires some problem-solving and engineering skills. The entire craft will take about a half hour to complete, which includes drying time. Cut one piece of colored paper to fit inside the shoebox lid. Take the paper out and use the ruler to draw a maze on it. The maze should have a clear starting point on one end and an ending point on the other. Use decorative tape to hold the colored paper in place inside the lid. Cut out a notch in the side for the marble start and end. Cut and glue straws on the paper to fit on the outlines of the maze drawn earlier. Place a marble at the starting point of the maze. 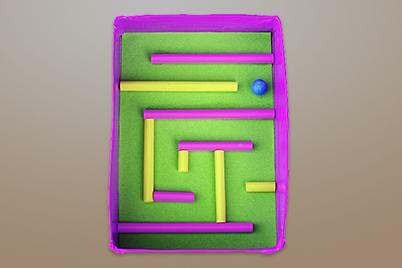 Use both hands to hold the lid and tilt back and forth until the marble reaches the end of the maze. If this craft is completed in a group setting, allow children to swap mazes after all have been completed. See who has created the most difficult maze and who is the fastest marble maze racer. Puzzles always seem to lose a piece or two somewhere in the cleanup process. This craft is the perfect opportunity to create a unique picture from leftover puzzle pieces. Children of any age can create this craft, but upper elementary students will probably have the most success. The activity should take less than an hour. Planning: Collect pieces from several puzzles of the same size. The more puzzles used, the more unique each child's creation will be. Give each student a piece of card stock to use as the base for the collage. Instruct students to create a complete puzzle of any size that fits the card stock using the old puzzle pieces. Students will have puzzles of varying sizes. Once a child has created a completely new puzzle, he can begin gluing the pieces in order onto the card stock. Allow to dry thoroughly before displaying. Collages are simple, common art projects that open up a child's imagination. The puzzle collage adds an extra challenge because students will need to find pieces from different puzzles that still fit together. To make the project more challenging, have students work together in a group to complete the artwork on a larger scale. After school program activities can be fun, educational or both. From homework help and mentoring to creating friendships and keepsakes the precious time students spend together after school can be memorable in many ways.